While we are all familiar with blood sugar and insulin resistance being a part of diabetes, but they can also play a role in health far before diabetes develops. It usually starts with insulin resistance, then blood sugars start to increase. When food (predominantly carbohydrates) enters the body after eating, it is broken down into glucose. Excess glucose in the blood stream sends a hormone signal to the pancreas to release insulin. Insulin acts like a “key” opening up little doors on the cells. The cells then allow glucose to enter the cell, which can be used for immediate energy. With insulin resistance, for a variety of reasons – including excess weight, poor quality sleep, stress, and physical inactivity – the cells become resistant to the action of insulin. Meaning, the key no longer fits in the cell doors and the glucose cannot get inside to be used for energy. This leaves glucose in the blood stream, resulting in high blood sugar. If left unchecked, excess glucose is highly toxic and leads to cell damage throughout the body. When the blood sugar remains high, more hormonal signals are sent to the pancreas to secrete even more insulin. As a result, you end up with excessive glucose and excessive insulin in the blood. Insulin is a fat storage hormone, so excessive insulin in the blood can lead to fat storage. In addition to fat, the excessive glucose and insulin can cause inflammation in the body and can be the start to many disease processes. Here is a quick visual explanation of insulin resistance. Regardless of how severe your insulin resistance is, you have the power to make your body more sensitive to insulin through diet changes and lifestyle choices. So, if you are struggling with insulin resistance of any kind, here are a few things that I recommend doing to help improve your sensitivity. You may have been led to believe that eliminating carbohydrates is the way to cut your risk of high blood sugar and insulin resistance. After all, high glucose is a problem with too much sugar in the blood, so eliminating sugar should solve this problem, right? Maybe, but the complete elimination of all foods with carbohydrates is nearly impossible. So, instead focus on what I call “smart carbs”, which are low glycemic carbohydrates that are processed slower than other types and don’t have such an impact on blood sugar. The glycemic index was developed to determine how quickly or slowly a certain food will raise your blood sugar. Although this system isn’t perfect (you can read more about pros/cons in this blog post) it can give you a starting point when you are trying to choose foods to eat. I recommend, if you are trying to improve insulin resistance, that you stick with foods on the lower half of the scale the majority of the time. These are less likely to spike your blood sugar, allowing your body process the carbs at a slower rate. Despite the low fat dietary trend in the past, healthy fat is a necessary part of a well-balanced diet for everyone. These are all rich in cardio protective fats, and have other health benefits. These fats promote the absorption of vitamins, A, D, E, and K which are important nutrients in a well-balanced, healthy diet. These healthy fats also have the added benefit of being very satiating, meaning they help you to feel fuller for longer. This effect is especially important for people trying to manage their weight. Fat also slows the absorption of sugar into the bloodstream which in turn, helps with blood sugar stabilization. So, don’t be afraid of fat, be sure to add a little to each meal! Breakfast is still the most important meal of the day. Researchers have shown time and time again that eating breakfast has a myriad of health benefits. From jump starting your metabolism, and increasing your memory and attention, to having a healthier weight and increasing the likelihood of meeting the recommendations for fruit and vegetable intake. The typical American diet consists mostly of high carbohydrate choices like pancakes, waffles, cereal, and French toast for breakfast. These don’t exactly start your day off right, especially if you are struggling with insulin resistance. These high carbohydrate choices are not only sugar and fat laden but are missing a key nutrient: protein. In a study from The Journal of Nutrition, researchers found that people who ate a high carbohydrate, high sugar breakfast of cereal and milk, were hungrier and had spiked blood sugars all day versus those whose breakfast was high protein, particularly from eggs. Whether you’re seeking blood sugar control or looking to manage your weight, I recommend a high protein breakfast. Including things like eggs, nut butters, or even meat, will help you feel fuller for longer and improve insulin resistance. What does balancing your meals really mean? Ideally all of the macronutrients (carbohydrate, protein, and fat) should be represented in your meals. While a big plate of pasta or a generous bowl of cereal may be filling, eating just “naked” carbohydrates, meaning eating carbs by themselves, can lead to unstable blood sugar and insulin levels and decreased energy throughout the day. I recommend including a protein and a fat source, in addition to the smart carbs at every meal. This will help to control your blood sugar levels, control your weight by helping you feel fuller for longer, and balance out your meals to ensure you’re taking in essential nutrients. Intermittent fasting is a term that refers to going without food for a period of time. Research is now showing that intermittent fasting improves insulin resistance and can lead to a significant reduction in blood sugar levels. Fasting for 12 or even up to 16 hours in a 24-hour period may reap the benefits of improved insulin sensitivity. This would mean that you could cease eating by 6pm, and resume again at 6am. Adjustments can be made with the timing of your evening meal and breakfast meal, but remember that breakfast is important. The idea behind this practice stems from chronic overexposure to insulin when in the “fed state”, which over time can lead to insulin resistance. Intermittent fasting is one way to reset your insulin sensitivity, and research is providing promising results. While modifying diet and lifestyle is an essential key to improving insulin resistance, many people are turning to supplementation for their potential health benefits. Cinnamon for example, has been linked to improved blood sugar control by lowering insulin resistance in several small studies. While the research is still inconclusive with respect to chromium supplementation, one study found that chromium in addition to biotin (a B vitamin) lowered participants A1c (the measurement of blood sugar levels over a 3 month time period) and blood sugar levels. There appears to be a link between magnesium deficiency and type 2 diabetes. Magnesium supplementation can have a variety of benefits including the improvement of chronic inflammation, insulin resistance, and oxidative stress. Lipoic acid, also known as ALA, is an antioxidant found in trace amounts in some foods but supplementation seems to help increase the body’s sensitivity to insulin. I hope this information serves as a guide in helping you to naturally improve your insulin resistance through simple diet changes and lifestyle choices. Making changes to improve your health can be an empowering experience and I’m delighted to encourage you through that journey. 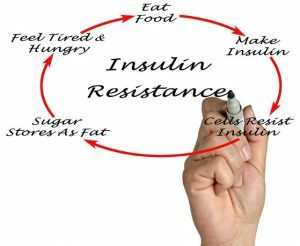 What kind are you willing to adjust to decrease insulin resistance?